It's a cold, windy Tuesday afternoon in November and Hannah Melde is hiding out in her car in the parking lot of the OC Mix Mart. Trying to look inconspicuous and casual, she pretends as though she is looking for a bag in her car. Right at twilight, just before the sun is about to set, she knows it's time to make her mark. As she climbs out of the car, she grabs a canvas bag filled with yarn and two knitting needles. "Time to yarn bomb!" she says. Dressed in a furry, leopard-print jacket, a hot pink beanie, and barefooted, she climbs the small planter surrounding the tree and quickly begins knitting her yarn. With mixed emotions of excitement and nervousness at being caught, she channels her courage to ward off the awkward glares she occasionally receives. Carrying-on in a fit of passion she says, "Most people look confused when they see me, but for the most part, yarn bombing has been positively received within the community." 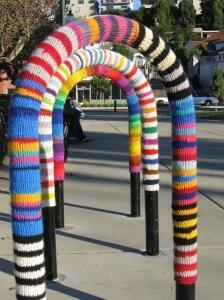 New to the street-art scene, Yarn Bombing is a non-permanent graffiti-like street art that employs colorful displays of knitted or crocheted cloth on permanent city structures such as bike racks, parking meters, trees, etc. The graffiti-like movement has taken on several names such as guerilla knitting, yarn storming, yarn-fitti and grandma's graffiti. Within the past several years, its increasing popularity has transformed it into an internationally recognized display of art. Long Beach resident and fellow yarn bomber, Sandra D., goes by the pseudonym "Yarnivore" and is committed to improving the look of the city. "I started on June 11, International Yarn Bombing Day, and I was hooked! It's a thrill to do and to plan and to see my work up when I drive past," she said. Yarnivore's latest instillation consisted of hanging "slices of toast" outside the breakfast spot Egg Heaven on Fourth Street and Ximeno Avenue in Long Beach. "I know that shop owners like it! It brings attention if I 'bomb' a bike rack in front of a shop or even their front door," said Sandra. Although Sandra commonly goes by "Yarnivore" in the yarn bombing community, she ‘tags' her instillation with her personal card to promote her works of art and to create a buzz around town. "I love hearing from people that find my card if I attach one to my work." While Sandra is open to sharing her name, others are not. For those that prefer to remain anonymous, these pseudonyms give them the ability to mark their work while concealing their identity. An anonymous yarn bomber in Berkeley who goes by the name of "Streetcolor," has put up more than 90 yarn bombs over the past several years. "I yarn bomb during the day so that I can talk to people. And see. I yarn bomb at night if I'm unsure about a new place and their attitudes to graffiti. Every city is different. Mostly they are fine here in the Bay Area. I put up three pieces in Charlotte, N.C. and they were removed in hours. I have been stopped by police in Sacramento after someone complained," said Streetcolor. "They just made me take it down." Why do people do this you ask? For "Streetcolor," she likes yarn's ability to change a street and a city by making it more beautiful. "I like art being in an unexpected place doing what art can do. It triggers people to wake up for a moment and be more alive," she said. Hannah Melde, 19-year-old Orange County resident and OCC student, yarn bombs just for the pure fun and excitement of it. "Although I get multiple looks of confusion from people passing by, I do it because it's art, public art, instillation art," said Melde. Melde had her first encounter with yarn bombing while on a road trip up North this past summer. "I already knew how to knit so when I saw it for the first time, I thought – ‘I could do that!'" Having learned how to knit by the time she was in sixth grade from her mother and grandmother, Melde couldn't help but join in on the movement. As an aspiring artist, she hopes to continue with community college and eventually attend an art school. Hannah prefers to be called "Flower Child" and welcomes any knitting "flower children" to join her on her adventures in an effort to improve our urban landscape one stitch at a time. You can follow her on her blog at http://flowerchild789.blogspot.com.